Jhen & Company: NEW BLOG. NEW DAY. I couldn't sleep. My mind was full of thoughts of recent events from these past few months. I tossed and turned, rolled out of bed, walked around, got back into bed, and tossed and turned some more. Things needed to change. It was last spring when we began the foster to adopt process. And we knew it was going to be tedious. After multiple interviews and paper work through a private organization, we received the phone call that would give us our long list of "to-do's" before we could proceed any further. It took us a while to process our list. We even contemplated switching to county instead of private so we could avoid the list. But we eventually realized that the list was made to best protect us and the kids in our future care. So we began the steps to check off our list. And so we have this past year many of you have been a part of or had been following. Crazy moves that an outsider wont understand, or if they try, seem absolutely ridiculous. But to the intimate ones who walked it with us, knew that each choice had a specific purpose- to get us to where we had aimed to be. I don't remember the first time I heard it stated that way. Probably some pinterest quote. But either way, it summed up what Jon and I had always wanted to do. And I lost track of that. I began to try to keep up with the "next best thing" or fit in with the crowd of who's who and what's what. Which in the depth of my heart, I really don't care about, but easily got caught up in. Which lead me to the other night of tossing and turning. I had recently closed this blog to private. I wanted to be less out there for people to critique. I was tired of outsiders taking one post and deciding that was the definition of who I was. I was tired of being constantly concerned with what others thought of me. So I ripped the band-aid off and closed it down. We live in a home without cable or internet. So the temptation to blog or stay on social media is easily removed. I get my "dose" whenever I head into work and swoop on some "free time". But when I'm home, I'm learning to fully be HOME. Which lead to the change in this blog. 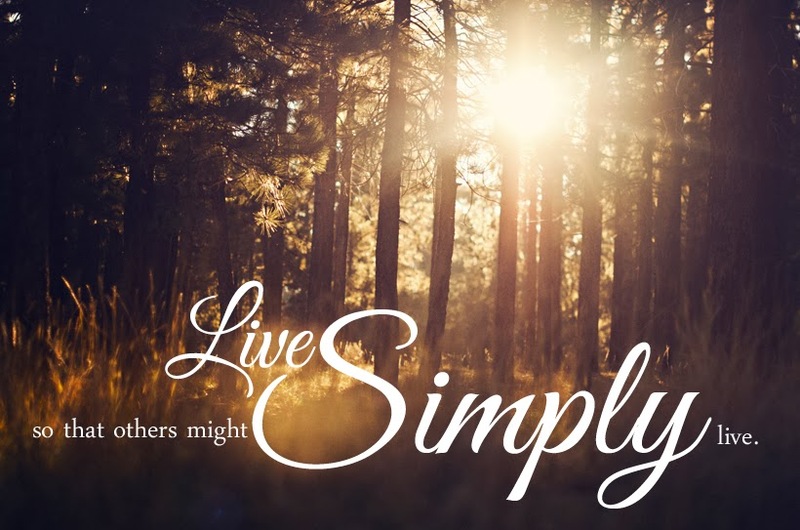 Simply Living. I wanted to document the growth and learnings of our family as we continue to strip away things that aren't necessary and learn to live off of minimal. This is the blog of how our family is learning to strip away of ourselves so that we have much more to give back to others. Just wanted to say happy due date :) I pray you have a joyful and easy delivery!